A mountain pass is a low point between two areas of higher elevation. It's also defined as a gap or a dip in a ridge crest. 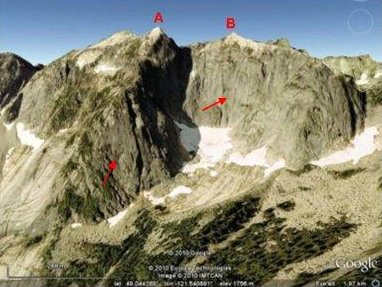 Alternative names include saddle, gap, notch and col.
A col is a saddle-like gap in an arete. It is formed by headward erosion of two glacier cirques towards each other which carve a gap in an arete. 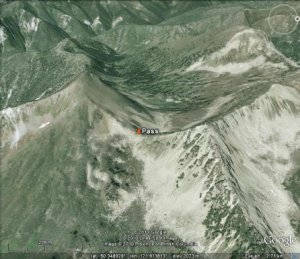 In the following images and the topo map (1:20000), the pass is located between two peaks with its lowest point at an elevation of 2125m. It also divides the two valleys or drainages located to the top and bottom side of the photo. 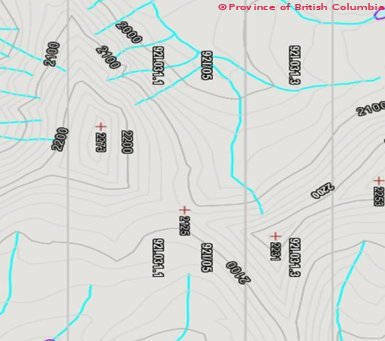 Streams originating from high ground on either side of the pass flow into these drainages. A cliff is a very steep, vertical or overhanging rock face. Cliffs are represented by very close (or sometimes touching) contour lines. In the case of an overhanging cliff or a cave, the contour lines would intersect each other, that is at the same location on earth's surface we need to indicate two different elevations; in such cases the lower elevation contours are drawn by dashed lines. Also note that if a feature such as a small cliff is shorter than the contour interval, then it may not show up on the map. 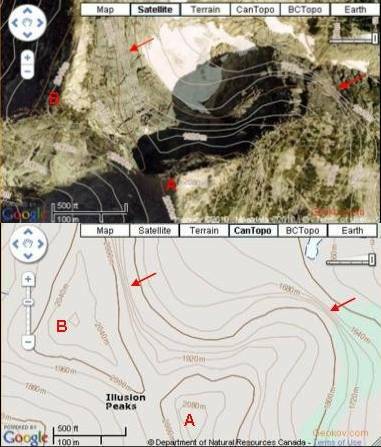 For exmaple a 15m cliff band may not be detected on a topo map with a 40m contour interval. In the picture above we are looking at rock faces of two peaks from northeast. The two pictures to the right show top view of the peaks with north pointing up. Contours are closest or touching on the steepest part of the cliffs. A depression is a low point in the ground which is surrounded by higher ground in all directions. Examples of depressions include volcanic craters, sinkholes, pit craters, and impact craters. As we've seen, a series of concentric closed contours (i.e. 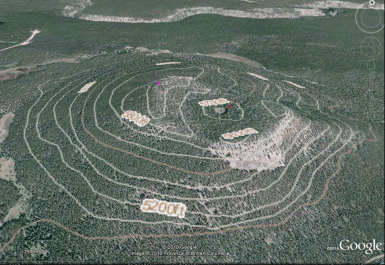 irregular circles) are used to represent hills, mountain summits, knolls, horns, etc. In such cases the inner circles have a higher elevation than their outer surrounding. A depression is represented by a series of concentric closed contours with the inner contours having lower elevation than their outer surrounding. 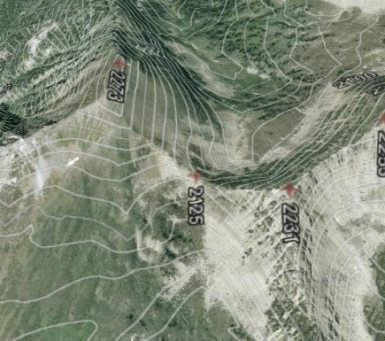 There are small tick marks or hachures on these contour lines pointing towards lower elevation. Such contours are called hachured contour lines (also seen written as hatchured) or depression contour lines. The image with the three closed hachured contours represents a depression; the elevation decreases towards the middle. The contour interval is 20m. The area inside the 1260m contour should have an elevation greater than 1240m and less then 1260m. The hill in the photo has a depression or crater on top (maybe a cinder cone with breached crater). 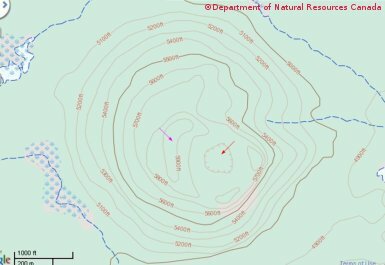 The depression contour line in the middle has an elevation of 5700ft with a contour interval of 100ft, therefore the lowest elevation in the middle of crater is somewhere between 5600ft and 5700ft elevation. The high ridge line on the left side of the crater is sorrounded by 5900ft contour line. In this case the elevation increases inside the enclosed contour, therefore the elevation of the high ridge is above 5900ft and less than 6000ft. 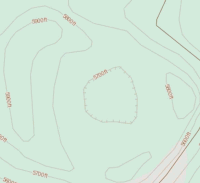 Using Geokov Map Maker, create a shaded relief map (hill shading), as shown in Map Maker Examples, in order to better practice topo map reading and terrain identification.